I am attempting to stay up-to-date with the latest advances in bathroom technology, but every time I use the ladies room it is a whole new learning curve. What do I mean exactly? Some places have automatic faucets that turn on when your hands line up within the precise perimeters and a warm spray douses the germs away. Sometimes, you have to play games with those faucets and literally spell “P-L-E-A-S-E” in sign language before they turn on, only to shut off once your hands are sudsy. 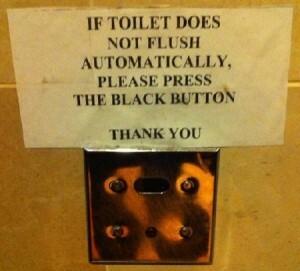 Then we have the automatic flushing toilets…but only in some bathrooms. I find that they flush when I walk in and close the door, they flush again just before I sit down, and when I am really finished I practically have to do the potty dance before it flushes. Don’t get me wrong, I totally understand the thinking behind this ingenious idea, I have kids you know, but in our house we always had success with a little phrase I liked to say when they were young, “flush when you are finished.” What level of laziness are we fostering here? What happens, heaven forbid, in the future…or next week while visiting Tombstone, and we find ourselves using one of those traditional toilets, will we remember what to do? I was in a tiny little bathroom the other day; you know the kind where you have to take off your purse, twist in sideways, hung your knees in real tight and then try and shut the door. This petite little loo had enough “power in the flush” that flushing was deafening. I had to hang on for dear life just to avoid getting sucked into in the sewer vortex. We are a country brimming with originality and resourcefulness. We have gadgets for everything and the infomercials to prove it. You can add a bump to your hair instead of teasing it for free; slap chop your onions instead of using a knife; and watch TV right there on your refrigerator door. Call me ridiculous, it seems to me we are spending too much money attempting to make our life simpler when we already have all the tools and know-how at hand. If there was ever a gigantic “EM pulse” like they occasionally portray in the movies that could shut down all the electronics in the world, what would we do? How could we check our status on “Facebook” and figure out our place in society? How would we spend all that free time our fingers would have from not typing, texting or gaming? Or worse, how would we learn to form our own opinions without the media telling us how to act and think? I say we start going back to basics now and practice the “good ‘ol days” for nostalgia sake if nothing else. Use the pots and pans in our cupboards to cook or go grill on the BBQ. It may mean having to wash some dishes, but looking back I had some pretty fond memories of that time together with whoever got stuck doing them with me. Go over and talk to your neighbors instead of calling, emailing or texting them. The look on their faces will be worth the walk, and you will have exercised without using a single kilowatt. Finally, go ahead and dust off Candyland, ignore the whining, and laugh again together as a family in the simplicity of electronic-free fun. Today is my day off and while we can rocket men into outer space, we haven’t yet managed to invent a house that cleans itself. Looks like today is the day I am getting back to basics myself…starting with toilets.